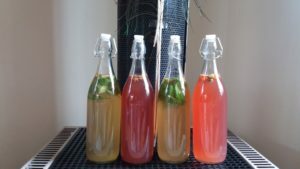 Ayurvedic Artisan Kombucha – Perfect Summer Drink – Available in unique flavours! I make Kombucha with a well balanced blend of organic, wild harvested, natural, organic herbal tea and spices and pure filtered Reverse Osmosis water. My Kombucha is not pasteurized like many other brands. It is a living drink full of nutrients from the tea, probiotics from the culture. It is fragrant, nourishing and refreshing. The flavors are harmonized with a fizz. You can drink it on its own or mix it with juice or soda water. Once you have tried my Kombucha you will fall in love with it! While making Kombucha I keep in mind various Ayurvedic Constitutions and Doshas (Humors). I have developed recipes that cater for three different Doshas – Vata, Pitta and Kapha. More information below. According to Ayurveda we are made of five elements – fire, water, air, ether and earth. These five elements are in different proportions in each of us. A Humor or Dosha is a combination of two elements. There are three Humors – Vata, Pitta and Kapha. Each one of us a certain amount of these three humors in our body. However there is a predominance in one or two humors which determines our basic constitution. Eating according to our constitution brings homeostasis, great health and well-being. I use flip top bottles to minimize on environmental waste. They can be returned back for a refill. For larger quantities, please pre-order. Pick up from Beach Haven. Kombucha is a fermented, lightly effervescent, gut and immune supportive beverage, traditionally consisting of black tea and sugar that’s used as a functional, probiotic food. The sugar-tea solution is fermented by bacteria and yeast commonly known as a “SCOBY” (symbiotic colony of bacteria and yeast). It contains a colony of bacteria and yeast that are responsible for initiating the fermentation process once combined with sugar. Although it’s usually made with black tea, kombucha can also be made with green tea, redbush tea and other non-caffeinated herbal teas. After fermentation, kombucha becomes carbonated and contains vinegar, B vitamins, enzymes, probiotics and a high concentration of acid (acetic, gluconic and lactic). These bacteria are known as “cellulose-producing bacteria,” meaning they produce cellulose, which acts as a shield to cells. Drinking kombucha every day can help you to maintain peak immune health, which trickles down into an impressive number of benefits for your overall health. It’s a healthier and delicious substitute for sodas, satisfying that craving for a fizzy drink. Get in touch to place your order or ask questions if you have any!